President, 1998 to date; publisher of The Solari Report. Solari Investment Advisory Services, LLC. Hickory Valley, TN. Managing Member, 2006 to date, of this investment advisory firm. President, 1991-1998. Responsible for founding and building this broker-dealer/investment bank with special emphasis on financial software technology and advanced decision science. Transactions for government and private clients totaled $12 billion of auctions and private placements. Portfolio strategy for the Federal Housing Administration related to $400 billion of mortgage insurance and related securities and real estate assets and liabilities. Transactions and portfolio strategy relied heavily on pricing infrastructure of software, databases and pricing tools used to identify and price existing and pro forma geographic flows of private and public income and investment on an integrated basis. Assistant Secretary for Housing-Federal Housing Commissioner, 1989-1990. 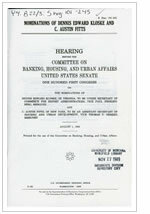 Responsible for the operations of the Federal Housing Administration, including: annual originations of $50-100 billion of mortgage insurance; servicing of $320 billion of mortgage insurance, mortgages and properties, portfolio analysis and pricing for 63,000 communities; production and management of assisted private housing; reengineering of organization of 7,000 employees in 80 offices nationwide; migration of systems to network systems and tools; and advisor to the Secretary on capital markets regulatory responsibilities, including the RTC Oversight Board, Federal Housing Finance Board and Home Loan Bank Board System, Fannie Mae and Freddie Mac. Focus included changes in law, regulations and administration to institute financial and appropriation controls and financial, actuarial and place based disclosure for FHA, federal credit programs and agencies government wide. Click image left to view full appointment document. Managing Director and Member, Board of Directors, 1986-1989; Senior Vice President, 1984-1986; Vice President, 1982-1984; Associate, 1978-1982. Served in the Corporate Finance, Energy Finance, Mergers and Acquisitions and Public Finance Departments.